Christey and I love throwing dinner parties. The occasion doesn't matter, the level of formality doesn't matter. We're Floridians -- most dinner parties, I'm cooking in bare feet. Every Christmas, we make a four course gourmet meal for whatever family is in town. We've also thrown parties with six hours notice, just because we felt like it that day. I had an idea once after re-reading Michael Pollan's The Omnivore's Dilemma about the methods of tasting grass-fed beef. That musing out by my grill one day led to a 14-person epic party sponsored by Foodbuzz's 24x24. All of which brings us to Project Food Blog Challenge #3: Get creative and host a luxurious dinner party where your guests will discover new tastes and exotic flavors. Share your hosting secrets with readers, like how to cook for a crowd, plan a menu, or involve guests in the prep. I love this challenge because it gives a chance for all of us foodies and dinner party hosts to show a "behind-the-scenes" of how a dinner party comes together. This sounds schmoopy and sappy, but Christey and I complement each other so well, it's no surprise we are such a happy couple. Once we've decided to host a party, the ideas start bouncing off each other. I throw myself into the menu, Christey throws herself into the theme and setting. She suggests alternatives or trends with the food: "Why don't you do a sauce with tomato for the ravioli, and a cream sauce with the steak so there's color interest with each course." I suggest things like, "why don't we do appetizers outside, then inside for the main? Then we can all hang out while I'm grilling the steak." I like to mix ingredients from all over the world using classic cooking techniques. It's sort of a fusion approach (though "fusion" can be a loaded term), and it can be easy to mangle. Some cultural ingredients would be nice to blend together for international relations, but would be jarring together in a meal. Cilantro and cloves? I can't think of too many ways that would work...though who knows. Cooking is a strange art. In addition to multicultural ingredients, I also wanted a firmly local ingredient. So, on a high level, things sound complicated -- three courses that blend together by taste in a logical progression, using classic techniques, yet international flavors, all tied together by a local ingredient. Also, due to the nature of dinner parties, many parts of the meal had to be prepared in advance, to keep the flow of courses from being interrupted. For the local ingredient, I was hoping for blue crab. Sure, there are plenty of stores around that sell live and local crab, but we live on salt water and I own a crab trap, so the night before the party, I baited the trap with canned sardines, tossed it in the water, and hoped that Neptune would help provide an ingredient for our meal. The backyard is about as local as you can get. Well, that evening, Neptune apparently was feeling crabby. I caught five crabs in my trap, all male (I toss the females back for conservation reasons), and all of good size. Blue crab it was. We bounced a lot of ideas around. I originally planned the whole meal around a bisque (soup, even bisque, can be cooked early and is forgiving of being kept on a simmer). We dropped that idea and dove into puff-pastry or filo dough, batted it around, then abandoned that as well. I had some frozen lychee juice that I made from a couple pounds of fresh lychees last season. Lychee juice is exotic, but has a fruity taste something like citrus and cantaloupe -- I figured it would make a good sauce. I didn't want all three courses to be lychee, but appetizer and dessert would work. That lead to chocolate mousse for dessert because it's my favorite, and it's easy to make ahead. Chocolate and lychee would be really nice. Christey and I decided on blue crab and cheese fried ravioli for an appetizer -- again, the raviolis (which I planned to roll myself) could be made ahead and cooked quickly, but the crab and cheese would go well with lychee juice in the sauce with (as Christey suggested) a tomato paste base which was familiar with ravioli, but was also pleasing to the eye. So, mousse and lychee as dessert, and crab ravioli and lychee as an appetizer. The main was giving us trouble...until I thought of maybe adding some chili to the mousse for a bit of spice. Chocolate and chilies are popular (we got a sample once from Cowgirl Chocolates that were amazing). Chilies and lychee would go together in a spice/fruit kind of way, and that kind of nailed it for both of us. Steak goes with blue crab. Steak goes with chilies. How about a smokey chili like chipotle (smoked jalapeños) for both the mousse, and the steak? We could pick filet mignon because it's good tender meat despite its reputation, but goes really well with a firm hand directing spices and sauce. Instead of topping the steaks, we could stuff them with the same cheese and blue crab as the ravioli, along with some minced chipotle. I could also make a cream-based chipotle sauce for the steak which makes the course something of a tri-lingual pun on my part -- French steak au poivre is a classic peppercorn steak using similar techniques, and in English "pepper" may mean peppercorns or Mexican chilies (though each are different words in French and Spanish). That was the menu, and the tie-in, with all of the permutations it took to get to this point: Fried ravioli with goat cheese and blue crab, with a lychee tomato paste sauce. Filet Mignon, stuffed with blue crab and goat cheese and chipotle, with a chipotle cream sauce. Chocolate mousse with chipotle infused lychee juice. Start and end with lychee. Middle and end with cream and chipotle. Start and middle with blue crab and goat cheese. There's enough of a flow that it all makes sense but isn't monotonous. There's a local ingredient featured. There are classic techniques (mousse, ravioli...and the sauces would be based on the technique of sauce Suprême) but mixed with decidedly non-French ingredients like lychee, chipotle, and blue crab. In addition to the four adult guests -- Krissy (The Sugar Pixie), her husband Dave, Christey, and myself, we had our two youngest kids, along with Krissy and Dave's two young kids. Four adults and four children. For the kids, I wanted to make something that would match the idea of the adult menu, but wouldn't necessarily saddle them with crab and chipotle. Kids under the teen years tend to have pretty firm taste preferences. So, I decided to make a French mac-n-cheese using elbow noodles, and a sauce Mornay from scratch. It would match the French techniques of the adult menu, I chose to use sharp cheddar in the Mornay to give the sauce a familiar yellow, and yet this mac-n-cheese would be a lot tastier and healthier than the processed stuff in a box. So, menu out of the way, I start cooking, while Christey plans the setting and plating. 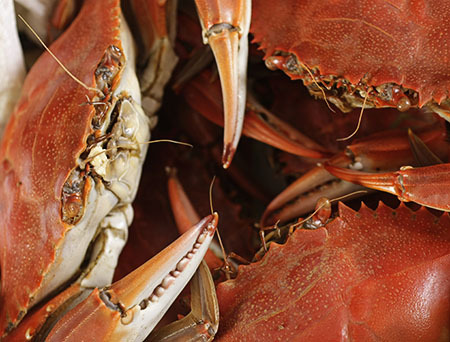 Blue crabs, like lobster, have to be cooked soon after removing them from water. Once cooked and cleaned, the cooked meat will last a while, so it was the first deed I tackled. Once the crab was cleaned, I actually started with the dessert. Mousse will keep in the fridge for a day or two, so it makes sense to start there. I melted Ghirardelli chocolate (a nod to Foodbuzz's hometown) in a bowl over simmering water, let it cool slightly, and mixed in egg yolks, some cream, and some lychee juice and a seeded chipotle I pureed in a food processor. I whipped up a cup of cream to stiff peaks, the egg whites to stiff peaks, and folded everything together. I like serving mousse in a martini glass, purely for the visual appeal. After dessert, the appetizer. I made the ravioli hours before the party. I have to admit I'm not an expert at pasta dough, but each time I make it, it gets a little better. The tricky job of getting just the right thickness, with minimal streaks and bubbles. The filling -- a french chèvre goat cheese, and blue crab. These can sit covered by a towel in the fridge for several hours. As far as prep work goes, I was pretty much ready. The mousse was done. The raviolis were done and only needed to be breaded and fried. I had to stuff the steak and make the sauces. Serve the ravioli, cook the steak, then serve the dessert! Ever see crab claws as a garnish? Christey stole the crab claws from me and came up with seat placements tied in with the meal. The guests arrive! And cosmos and martinis are served! Kids get their placements and settings as well, just like the grown ups! Once the sauces were simmering, I breaded the ravioli by dipping in buttermilk, then home-made seasoned bread crumbs. After that, 375 degree vegetable oil for about 6-8 minutes. The sauce is strained, then the appetizers are served! The steaks are done, so the rest of the meal is assembled quickly. While the steaks rest, some pre-blanched green beans are reheated in beef stock for a bit of flavor. The sauce is strained, then the main course is served! A great FotoCuisine shot -- guests enjoying dinner, with the photographer reflected in the window! Lots of work. Lots of planning. Lots of balance. But, lots of fun, which is why Christey and I just love doing this. We didn't even show a picture of the sink afterward!